[VAL GARDENA, BOLZANO] — We were on a long gondola ride heading up a long valley of undulating hills outside of the beautiful town of Ortisei, no doubt perfect ski runs in the winter. But it was summer, off season, so everything was super lush and green, hardly anybody around. The lift pauses at one skier drop-off then continues on, up up up and over a steep massive wall of granite, still shaded by the stark morning sun, darkening the interior of the gondola so much that you had to take off your sunglasses. Suddenly, you pop over the ridge and you’re thrust into the bright summer sun. Stammering to get your bearings again. We scrambled off, the hustling gondola nipping at our heels like a border collie. And that’s when it hit us. The hike down from Seceda is a fantastically easy hike. You take a lift up and over this ridge, then hike down to huts for lunch and beer along the way. This eerie Other World. A lush green carpet, the puffs of clouds dappling its folds with shafts of light moving across a great green and blue valley. Giant beasts of mountains thrusting to the sky. The only sound, cowbells clanging in the distance. I frisked myself, making sure I wasn’t wearing a bright orange furry suit on a Teletubbies set. I looked around. Freakish. Unreal. After a rushed breakfast decision to come up here, little did we know we’d hit the jackpot. When you first hear about the Italian Dolomites and see the amazing pictures of the area, you want to do as I did and say “I want to go there.” But trying to figure it out is kind of difficult because there isn’t just one mountain range, but more like a grid of mountain ranges, vast in area. 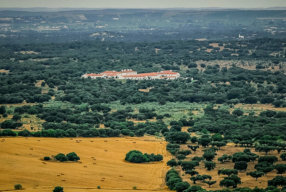 But as you learn more you realize that it is really broken down to a range of valleys, each having its own mountains, its own geological characteristic. 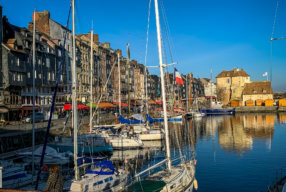 That’s why this whole area has been designated a UNESCO World Heritage Site. 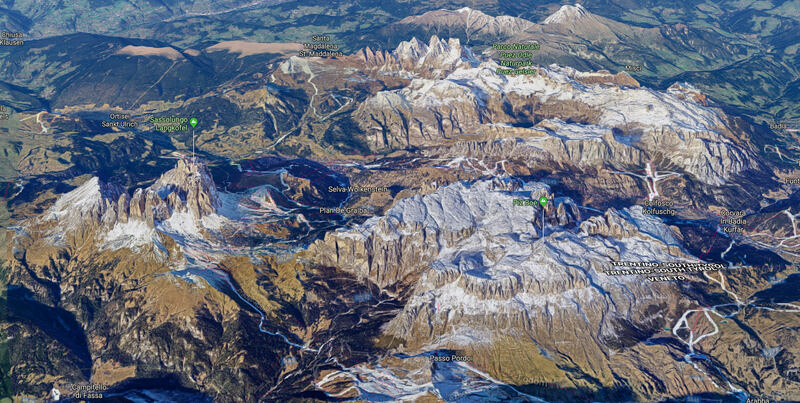 Val Gardena is one of those prized valleys. 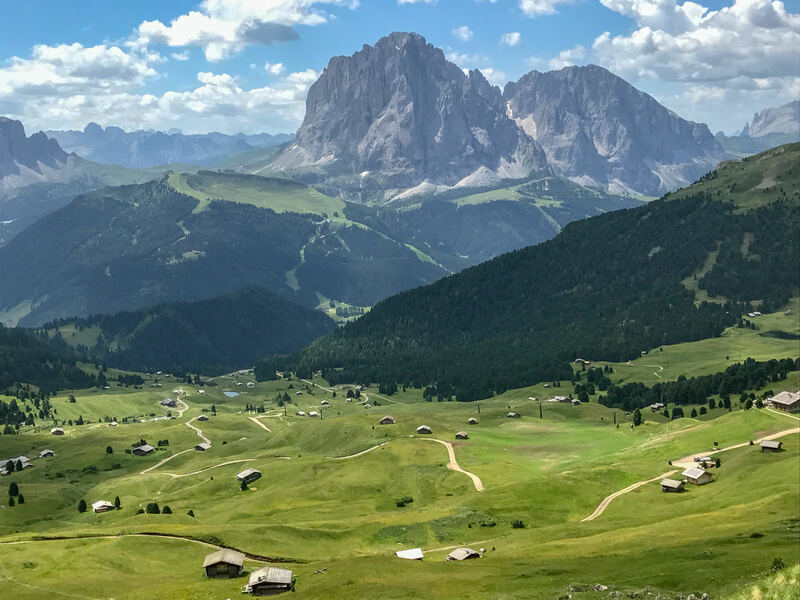 Val Gardena is almost like a “marketing region” comprised of a string of villages that pearl up the valley floor — Ortisei, Selva di Val Gardena and Santa Cristina — dramatic mountains looming over every shoulder like a crowded New York subway car. This was my second visit here, this time dragging my best friends along. My first trip was baffling, trying to piece it all together. It’s confusing because this has been an area in flux for thousands of years. First prehistoric, then its own isolated region of Ladin-speaking people cut off from the rest of the world due to its intense geography — the Ladin people and language dating back to Roman times, isolated from the world, but still maintaining their own ancient identity. Then it became part of Austria. Then divvied up again after the brutal WWI, where the front lines cut right through here, the spoils going to a reconstituted Italy. Because of that history, what makes the Dolomites difficult is that everything is in three different languages. German. Italian. Ladin. Often used interchangeably. So, for example, the sweet village of Ortisei is also referred to as Urtijëi in Ladin and St. Ulrich in German. So bear with me. 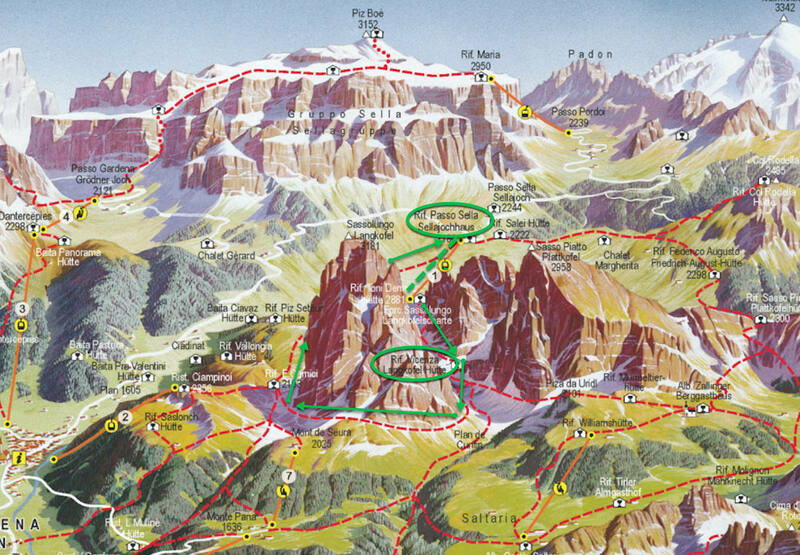 Even the Dolomites are also referred to as South Tyrol or Südtirol and Alto Adige. And then the Dolomites spread across multiple regions, so you could be in Bolzano, Trentino or Belluno. It’s enough to drive you crazy. But I’m here to help. 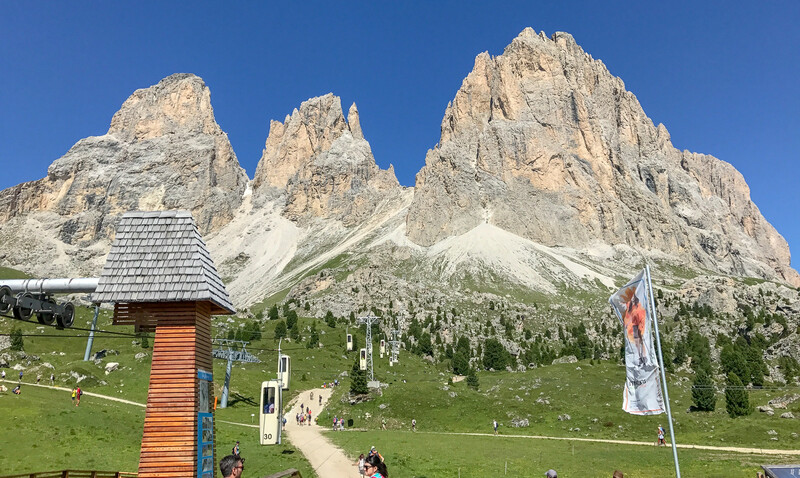 You can see the great Val Gardena valley as it wraps around the giant Sassolungo. 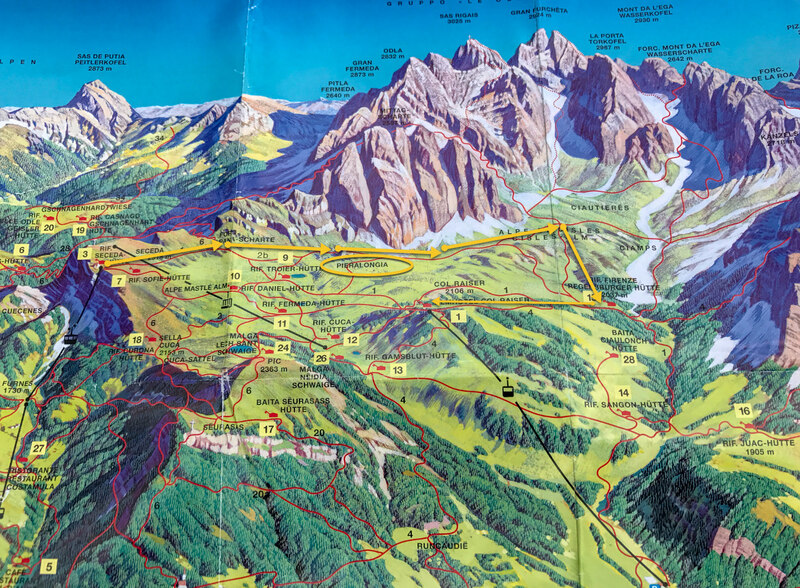 Starting with Selva, the St. Ulrich and Santa Christina is clipped off on the left. In winter, this whole region has 1,200 kilometers of ski slopes, 450 lifts, and 50 small towns. All interconnected. Much of it above tree line. One ski pass and you can ski all of the slopes and lifts, and ski from town to town. But in summer, this area is perfect for what I call by Mountain Strolling. All this turns to the lush rolling green carpet of grass and farms that it started out as. The sound of cow bells clanging in every pasture and valley. Chairlifts can take you on top of the mountains, often above treeline, and looping trails connect everything together. You can even hike from town to town, with a fantastic bus system that can take you back to your village. Each day you just head out and decide how far, how long and how hard you want to go. Family-run “huts” called rifugios — really, cabin-like restaurants that you can also stay overnight — are all along the way. Perfectly spaced out about half-hour or hour apart from each other, serving panini or polenta with porcini, with a spicy red Lagrein to wash it down and a doppio espresso to propel you to the next happy hütte. Proper bathrooms and toilet paper in each hut provide confidence and comfort along the way. It’s all so Civilized. 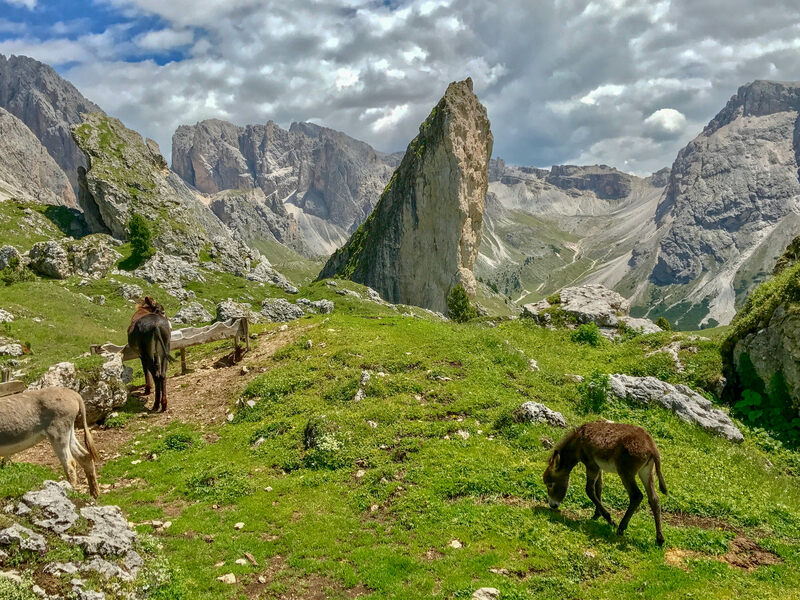 Everywhere you turn in lush, green Val Gardena you see these looming massifs, brooding over the valleys on all sides, like a Vulture Convention ready for something to happen. You’ve never seen anything like it. Vast crumbling walls jutting to the sky, each grouping having its own personality. I’m in heaven here. The Saslonch, Sassolungo or Langkofel is the highest mountain of the Langkofel Group in the Dolomites in South Tyrol, Italy. The name translates to “long peak” / “long rock” in all three languages. This is a great hike. Actually a hike-down-to-lunch spot. You take a goofy two-man standup lift that you load-in like a Roman chariot to the top of Sassolungo (one of the most pokey-outest of the Dolomite formations). It towers over the entire valley. 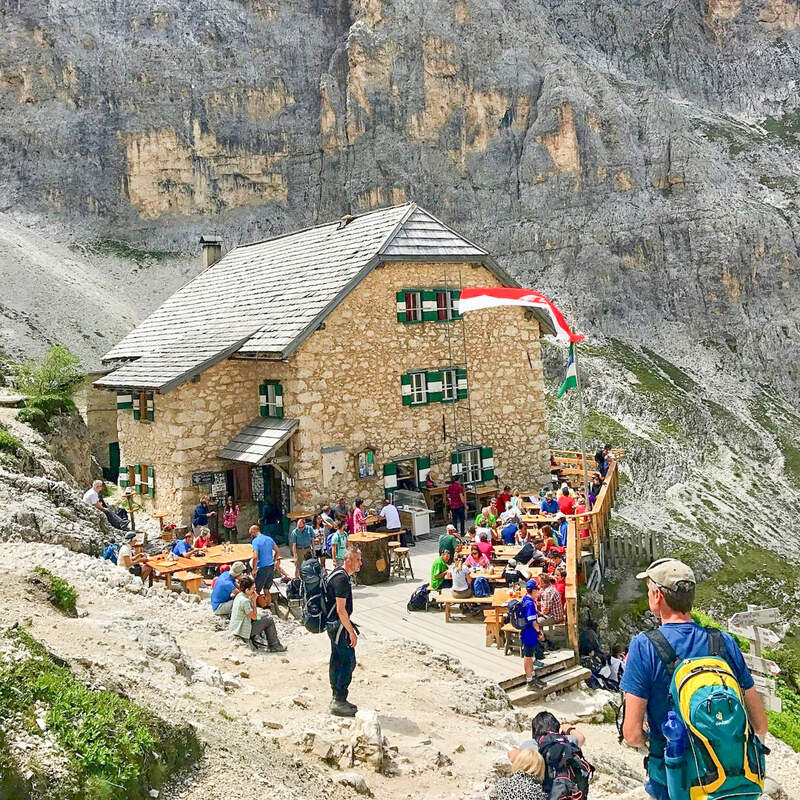 Everyone hanging out on a mountain top, having a nice cold beer, some polenta and local mushrooms and a doppio macchiato to encourage the next three hours of hiking. You drive up to Sella Pass and there is a great big parking lot and lift. You take the lift all the way up to a crux between the steep mountains, then hike down to Rifugio Vicenza. A stunning location. Then you hike down and around the giant Sassolungo massif back to your car. You take a goofy two-man standup lift that you load-in like a Roman chariot to the top of Sassalungo (one of the most pokey-outest of the Dolomite formations). One hour down this endless scree chute, like rock skiing, without skis…. and you can see a trail of ant people as far as the eye could see…. Some of the down part gets a little hairy and a little crowded, but worth it for what comes next. Just the absolute perfect place to put a restaurant! Rifugio Vicenza inside is nice, with full bathrooms and serving the traditional rifugio food of polentia and porcini, bolognese, sausages, stews, etc. It just. Doesn’t. Get. Any. Better. After a lunch, beer and a doppio macchiato, you hike down and around the massif. As it the trail wraps around the mountain, it keeps a pretty flat rolly polly trail, with views of the giant Sella Massif wall. You can see how steep the climb down is. See all those ants? Thems’ people. It takes about an hour to get down from the top to Rifugio Vicenza, steep and scree the whole way. But when you arrive, it’s about as cool as it gets. With a big deck and seating inside. Rifugio Vicenza sits perched in its own amphitheater. The drive down from Passo Sella. Just jaw-dropping. I mean, seriously. This place is ridiculous. So many amazing mountains. So many perfect hikes. Such a delightful way to get into the mountains. 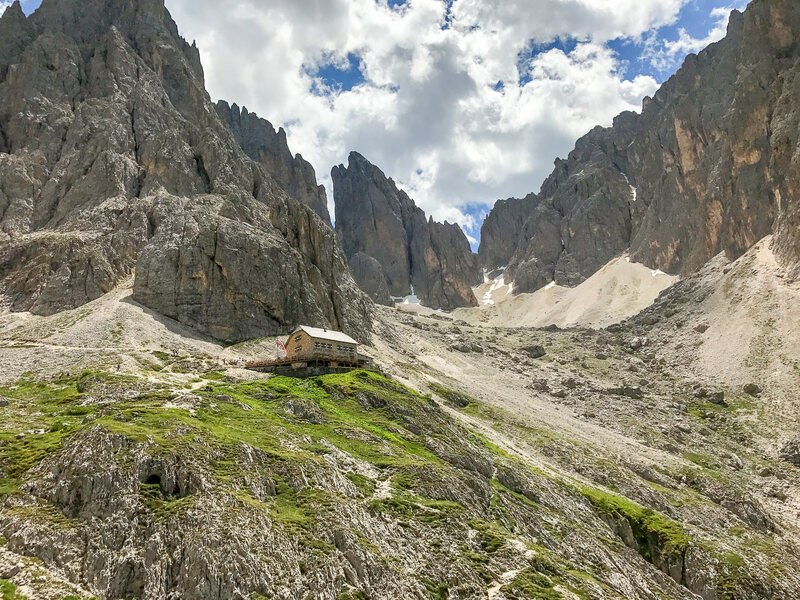 The Seceda hike is a four hour, two-beer, two-hut trek; my favorite so far. (Until the next one…) You can make it longer if you want because you’re up on a giant plateau. 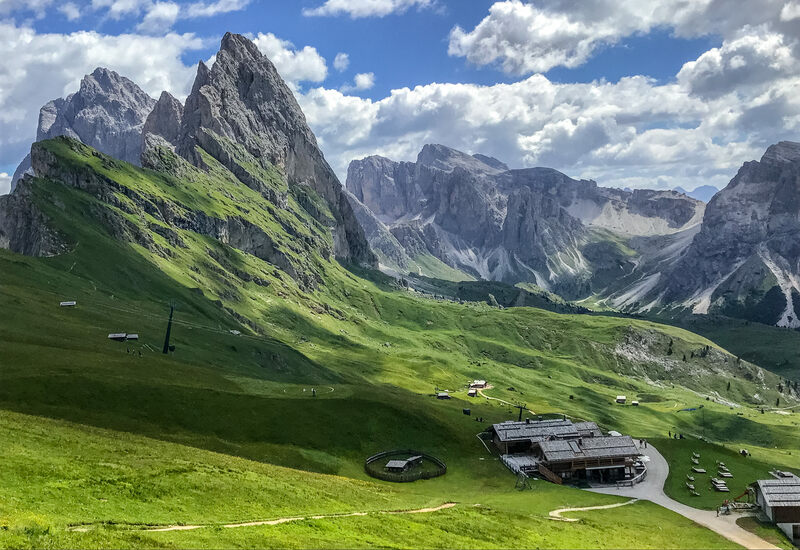 Here’s how it works: The hike is in the national park called Puez-Odle started with driving to the next town of Ortisei/St.Ullrich, taking a cable car to Seceda, (on the far left) up above steep rocky cliffs and dumping us in the bright sun on the other side. From there, you can see forever — it’s a national park studded with huge bizarre rock formations as far as you can see. 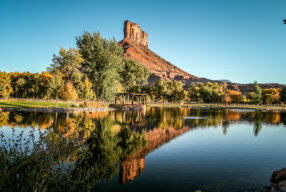 A huge basin opens below, rolling green and lush, like the set of a Teletubbies episode, pocked with hay barns and cow sheds and criss-crossing trails. Add in the singsong dingdalingdaling of invisible cows in the distance and the thing will remind you of that one Dead show that was outside. The view from the top of Seceda. That’s the Sassolungo formation from the previous hike, miles away. 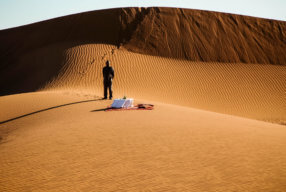 You can go off in any direction, trails funnel you down the valleys to the base, stopping for nourishment along the way. No need to pack your food, or even water, family-run huts are every 40 minutes our so, serving up good food, cold beer, hot espresso and toilets that rival a Hilton. (P.S. if you find a Canon point-and-shoot camera at one of the huts, DM me. ). These are just crazy looking mountains. Perfect for a leisurely Mountain Stroll. 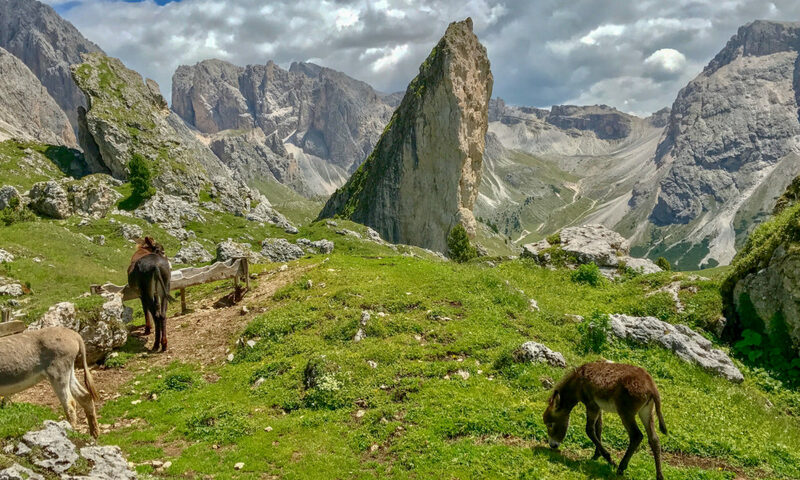 This hike was particularly easy, you take a gondola up to this high point, then leisurely wind your way down past all the moo cows dinging their clanging bells, to lunch and a spritz at a rifugio. Then further down you go, singing, to the next town and bus back to your car. It just doesn’t get any better. This was my favorite hike of our trip. Not very difficult. Make sure you hang a left as you get off, we missed it, but there are incredible views of the backside of these mountains. I can’t wait to go back. This easy hike is about as enjoyable as it gets. Leisurely strolling across the vast green plateau. It was almost surreal to be standing here, pushing a button and then seeing it in front of me. A beer and my best friends 20m behind me. This formation is called Piera Longia and it looks like devil’s horns. Malga Piera Longia is the rifugio stop on the way. Fantastic little place with a grazing cattle, stubborn mules and cold beer. Just go up, order food and sit around the picnic tables in the sun. I mean, check out this beer selection… on TOP of a mountain. After that, it’s on to the next hut. Just one cool range after another. That next hut is where we’re heading. Rifugio Firenze. About 45 minutes further down, you arrive at Rifugio Firenze. Time for another beer. Like a lot of other rifugi, Rifugio Firenze is a family owned working farm. They raise a lot of their own food and milk. A nice big deck to enjoy the sun and a beer. There are a lot of great restaurants in the many towns of Orisei, Santa Cristina and Selva. Be adventurous and venture into a different village each night, they’re each just minutes from each other. It’s Italy, so if anywhere was bad, they’d be out of business. These are the two nicest ones we’ve found. 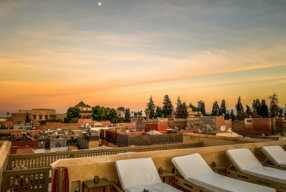 Restaurant Tubladel is on everyone’s Top 10 lists and there’s a reason. It’s really fantastic. We went there twice. 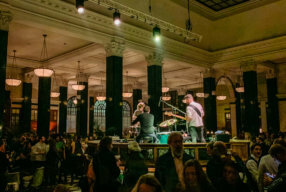 A typical stube but with exceptional meals and service. 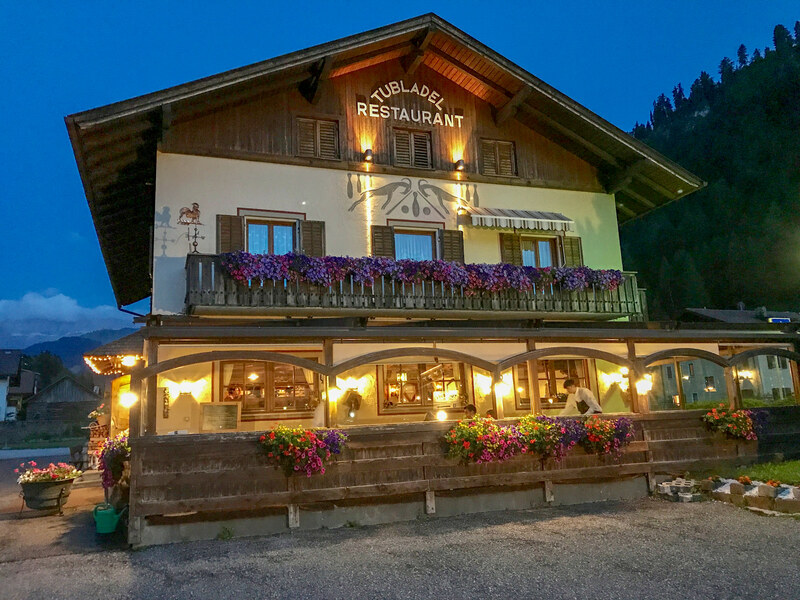 Restaurant Tubladel looks like most of the other alpine restaurants between here and Germany. But the food and service are top notch. Lagrein is the local varietal in Alto Adige and I fell in love with it. Nice and peppery bite. The Tubladel chef made a big deal of this special smoker they use and took us back in the kitchen to show us how well it work. Very compact. I want one. Ristorante Rosticceria Grill Room di Luis Sotriffer is a mouthful to say but so worth it. Right in the heart of Ortisei. Loved everything. Sit in the back room where they open up the windows to the cool mountain air. Here’s a very recent article 36 Hours in the Italians Dolomites in the NYTimes. Here’s a great overview article of the Dolomites in Elle Decor. 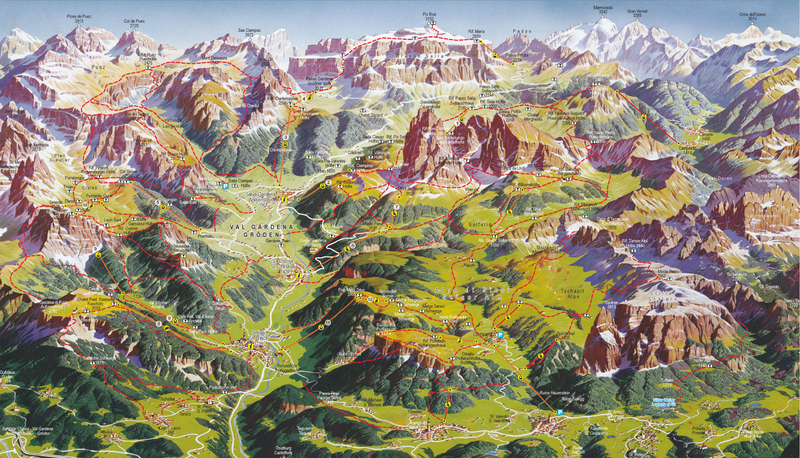 And this is the most useful and up to date guide to Val Gardena, the official website of the valley. I am so grateful for your post here about this dolomite region. I’ll be heading over from Kals am GrossGlöckner Austria in September 2019. As you said, it is hard to figure out where to start. But this was extremely helpful. Many thanks.